This decal looks so cute in my kitchen! All my guests read it and laugh at it. It's a perfect conversation starter. It was very easy to put up.. it actually to me less than 10 minutes. It is exactly as pictured as well. Love it! 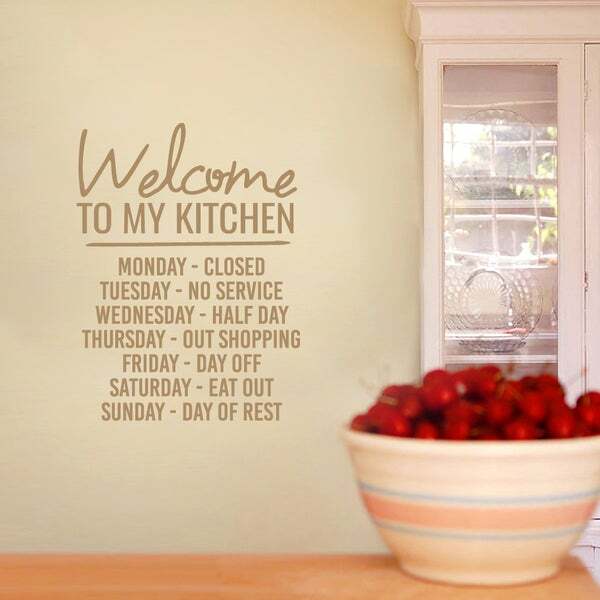 Welcome to my kitchen. Monday - Closed, Tuesday - No Service, Wednesday - Half Day, Thursday - Out Shopping, Friday - Day Off, Saturday - Eat Out, Sunday - Day Of Rest.' These funny hours of operation will make your guests and family laugh in your kitchen. Not a master chef. I can relate. Place this decal in your kitchen to make others smile. I ordered this kitchen decor on a Thursday and I received it the following Monday-SUPER FAST shipping! It was easy to apply on the wall and it only took me 5 mins. Don't use the directions-it will only confuse you. lol....just use your common sense!!!! I didn't have to use scissors or any other supplies-JUST be sure the lettering is straight before FIRMLY applying it on the wall. I'll definitely purchase more!!!!! This is the funniest thing and the coolest decal in the world. It’s defintley a Pinteresty vibe. Everyone that comes to our house compliments it. They’re great quality and great finish. The color that you pick is definitely true to what you get. My wife and I got the brown one and it looked great in our kitchen. It's too much work to put this on your wall. I wish I could return it. I love this . I will admit it took two purchases because I messed up the first one but I should have read the instructions better. It looks great and is a great conversation peice. Very hard to display; all of the letters did not transfer properly. Everybody that sees it, wants to buy it too.